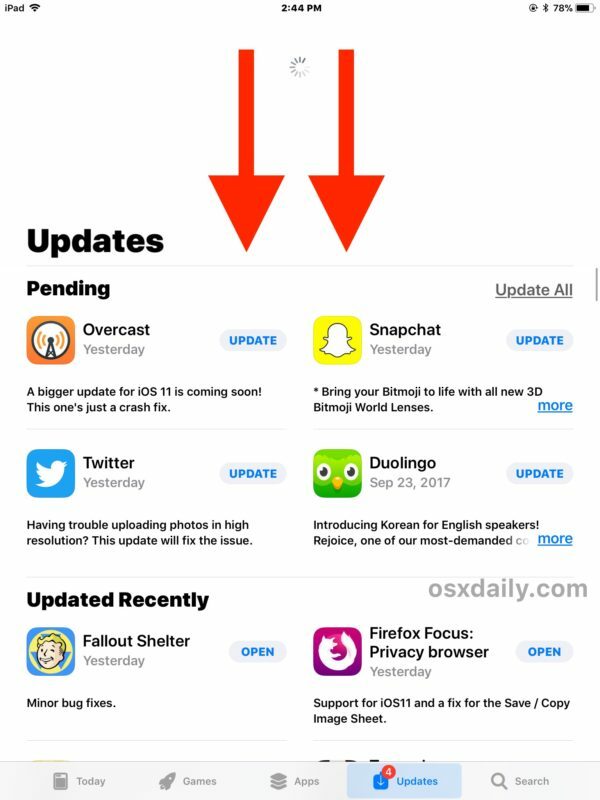 You can refresh the Updates section of the App Store on an iPhone or iPad, though how you refresh the Updates tab in the App Store has changed in the latest versions of iOS 11 compared to prior versions. 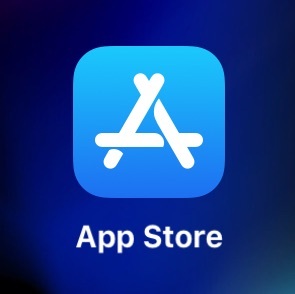 The good news is the change is for the better, and now checking for new updates to the App Store is better and easier than before. The tapping didn’t work..nothing happened…I then did the old standby pull down and it brought up 2 updates not previously showing. I find it annoying that readers here complain about not knowing the size of an update. Just do all your updates over WiFi and quit complaining. It was a question relevant to the topic. Personally, I find knowing the update size useful. I don’t expect everyone to be of the same opinion, I respect that we are all different. Please respect that I find it useful, and thought it worthwhile seeing if anyone knew if I was perhaps overlooking something. Totally agree Ben. My wifi runs at around 3Mbs and my mobile (cellular) 4G at around 25-50Mbs. I have unlimited wifi but 20GB per month 4G. I am frustrated that I can no longer see the size of the update from the update screen. Armed with that data, hopefully someone taking issue with questions being asked that are irrelevant to them, might be able to work out why someone else might prefer to pick and choose what updates are performed over which network. Man, it bothers me so much. How do you just choose to take information away, and dare call it improvement? Glad to see I’m not the only one irked by this! Annoying is that the app store does not refresh the list automatically when opened as it had. Also, apps are not refreshing for me over night as they did before with the “Automatic Downloads” switch turned on in the “iTunes and App Stores” settings. This doesn’t work for me. 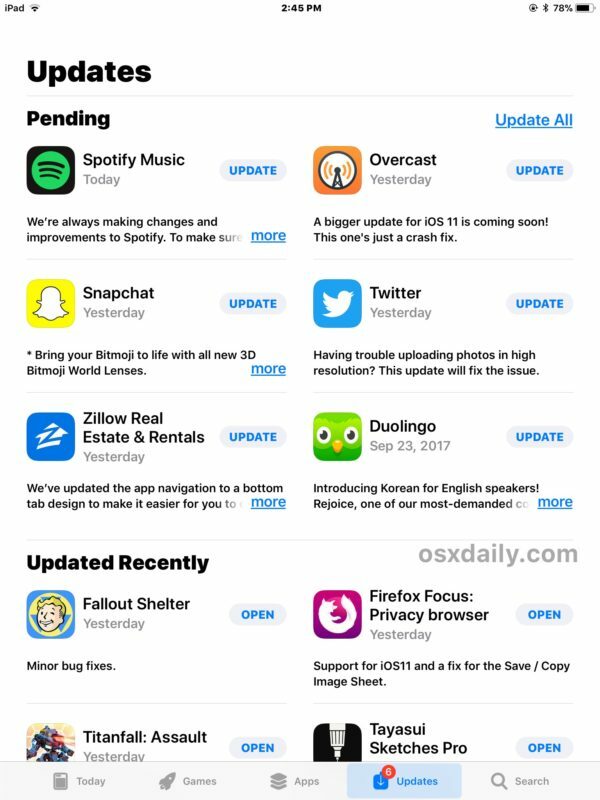 Apple needs to fix this so that when I go to the Updates tab, it shows the app available for update, like it did before iOS 11. I agree with Ben. I use the feature to determine if I have time to run the download while still connected to WiFi because downloads stop if it swaps from WiFi to mobile network. It can’t be that hard to include. I also agree that just because Ted doesn’t use the feature doesn’t make everyone else have to conform to his way of operating or gave the same set-ups as him. This is a global OS and we don’t all have the same network capabilities. He needs to learn to respect others. I concur. App size is a huge issue, especially since it seems like I’ve had to update my apps repeatedly every week for the last few months. I get that Apple doesn’t control app releases, but something changed to increase my average daily updates to a daily dozen, many 2-3 days after their last update. Unless someone wants to make a case that multiple vendors suddenly changed their operations, something at Apple is driving this. I have iOS v.11.2.1 and this trick doesn’t work for me. Maybe I do not know that “tap, then hold” means! Should it not be “Tap AND Hold”. Anyway, I can’t get it to work. Explain how I can tap THEN hold. After my finger hits the screen, unless I “AND hold”, what do I do with my finger before doing “THEN hold”. Peter, why don’t you tap and hold and refresh the App Store like the instructions say. Try it out. It works for me, what works for you? Tap and hold doesn’t work to my iphone too. But my ips is up to date. I don’t have a problem updating my apps, but under the Updated Recently screen, I have over 20 apps that have an OPEN button. This is despite the fact that all of the apps have been opened since updating them even as far as two months ago. This seems to be a little misleading. To clarify, the zone to tap and hold is *not* by or above the word “Update” at the top. 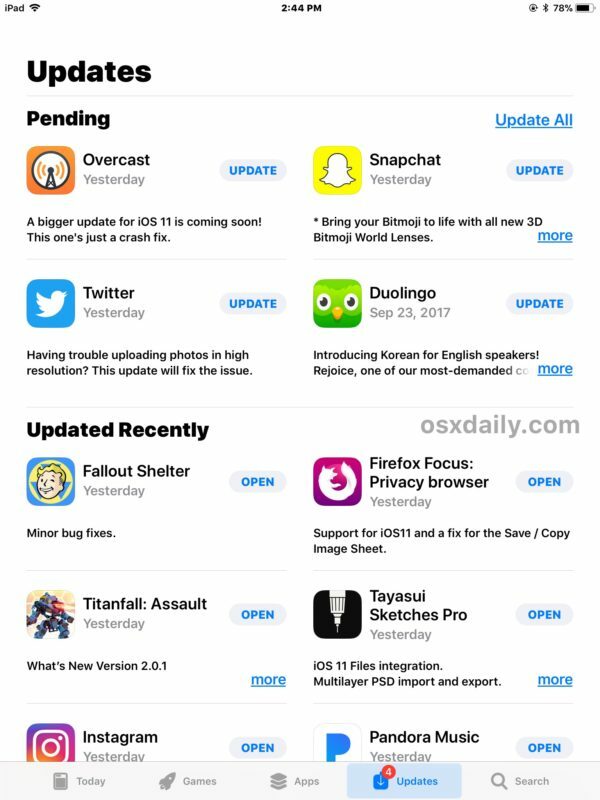 You need to tap, hold, and drag down anywhere beneath “Update,” either by “Available” or “Updated Recently”. Hope that’s of help.